Hector Centeno (b. 1971) obtained his B.Mus in Composition at UNAM, Mexico. He first composed exclusively for chamber music ensembles, but since 2004 his work has been devoted to electroacoustic music, transforming soundscape and other recorded sounds. Part of his approach to composition is inspired by Zen practices and its ways of approaching artistic creation and reality, as well as aiming for a balance between spontaneous, intuitive expression and rationality. His main tools are Open Source software programmes such as Linux, Csound and Ardour, among others. 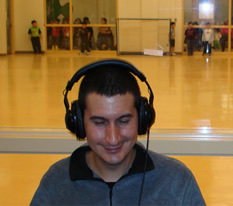 He is also interested in sound design for theatre and film and in multichannel spatialization. His music has been performed as part of the Sounds Electric Festival (University of Ireland), Sound Travels and Nuit Blanche Festivals in Toronto, the Harvest Moon Festival (Concordia University, Montréal) and other venues in Toronto as part of the composers collective AngelusNovus.net.